The celebrated physicist Stephen Hawking became embroiled in a deepening furore today over his decision to boycott a prestigious conference in Israel in protest over the state's occupation of Palestine. Hawking, a world-renowned scientist and bestselling author who has had motor neurone disease for 50 years, cancelled his appearance at the high-profile Presidential Conference, which is personally sponsored by Israel's president, Shimon Peres, after a barrage of appeals from Palestinian academics. The move, denounced by prominent Israelis and welcomed by pro-Palestinian campaigners, entangled Cambridge University – Hawking's academic base since 1975 – which initially claimed the scientist's withdrawal was on medical grounds, before conceding a political motivation. The university's volte-face came after the Guardian presented it with the text of a letter sent from Hawking to the organisers of the high-profile conference in Jerusalem, clearly stating that he was withdrawing from the conference in order to respect the call for a boycott by Palestinian academics. The full text of the letter, dated 3 May, said: "I accepted the invitation to the Presidential Conference with the intention that this would not only allow me to express my opinion on the prospects for a peace settlement but also because it would allow me to lecture on the West Bank. However, I have received a number of emails from Palestinian academics. They are unanimous that I should respect the boycott. In view of this, I must withdraw from the conference. Had I attended, I would have stated my opinion that the policy of the present Israeli government is likely to lead to disaster." Hawking's decision to throw his weight behind the academic boycott of Israel met with an angry response from the organisers of the Presidential Conference, an annual event hosted by Israeli president Shimon Peres. "The academic boycott against Israel is in our view outrageous and improper, certainly for someone for whom the spirit of liberty lies at the basis of his human and academic mission," said conference chairman Israel Maimon. "Israel is a democracy in which all individuals are free to express their opinions, whatever they may be. The imposition of a boycott is incompatible with open, democratic dialogue." 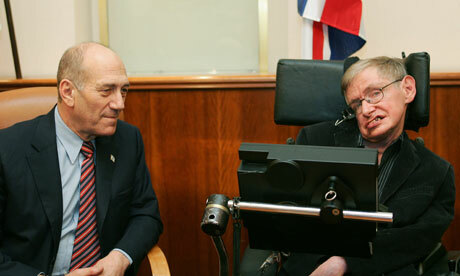 Daniel Taub, the Israeli ambassador to London, said: "It is a great shame that Professor Hawking has withdrawn from the president's conference … Rather than caving into pressure from political extremists, active participation in such events is a far more constructive way to promote progress and peace." The Wolf Foundation, which awarded Hawking the Wolf prize in physics in 1988, said it was "sad to learn that someone of Professor Hawking's standing chose to capitulate to irrelevant pressures and will refrain from visiting Israel". But Palestinians welcomed Hawking's decision. "Palestinians deeply appreciate Stephen Hawking's support for an academic boycott of Israel," said Omar Barghouti, a founding member of the Boycott, Divestment and Sanctions movement. "We think this will rekindle the kind of interest among international academics in academic boycotts that was present in the struggle against apartheid in South Africa." Palestinian academics sent a barrage of letters to Hawking in recent weeks in an attempt to persuade him to join the boycott movement. Samia al-Botmeh, of Birzeit University in the West Bank, said: "We tried to communicate two points to him. First, that Israel is a colonial entity that involves violations of the rights of the Palestinians, including academic freedom, and then asking him to stand in solidarity with Palestinian academic colleagues who have called for solidarity from international academics in the form of boycotting Israeli academia and academic institutions." Hawking's decision to withdraw from the conference was "fantastic", said Botmeh. "I think it's wonderful that he has acted on moral grounds. That's very ethical and very important for us as Palestinians to know and understand that there are principled colleagues in the world who are willing to take a stand in solidarity with an occupied people." Comments on social media in Israel were overwhelmingly opposed to Hawking's move, with a small number engaging in personal abuse over his physical condition. A minority of commentators supported his stance on Israel's 46-year occupation of the Palestinian territories. In addition to the letter sent by Hawking to the conference organisers, a statement in his name was sent to the British Committee for the Universities in Palestine, confirming his withdrawal from the conference for political reasons. The wording was approved by Hawking's personal assistant after consultation with Tim Holt, the acting director of communications at Cambridge University. On Wednesday morning, following the Guardian's revelation that Hawking was boycotting the Presidential Conference, Holt issued a statement saying: "Professor Hawking will not be attending the conference in Israel in June for health reasons – his doctors have advised against him flying." However, a later statement said: "We have now received confirmation from Professor Hawking's office that a letter was sent on Friday to the Israeli president's office regarding his decision not to attend the Presidential Conference, based on advice from Palestinian academics that he should respect the boycott." In a telephone conversation with the Guardian, Holt offered "my apologies for the confusion". This year's conference is expected to be attended by 5,000 people from around the world, including business leaders, academics, artists and former heads of state. Former US president Bill Clinton, former UK prime minister Tony Blair, former Russian president Mikhail Gorbachev, Prince Albert of Monaco and Barbra Streisand have accepted invitations, according to organisers.